I am thinking of starting a new blog post series in the name of 'save, spend, splurge' giving different price options of products, clothing and accessories! This particular post stemmed from me searching for a gold look/plate simple love ring as i think they look so elegant and classic and found a few alternatives for no matter your budget! I already own the Gold coloured love ring from accessorize that costs a purse friendly £4 but it has heavily tarnished and now looks silver thats why i was looking for a more expensive alternative that was gold plated as i know i would get a lot of wear out of it. This particular style isnt available on the website currently although there is over variations of it however it is available to buy in store. I love both the Zoe and Morgan ring and the Laura Gravestock one. The Morgan and Zoe is a 22ct gold plated rope style ring which makes it a little more unusual than the simple band of the Laura Gravestock one that is 18ct gold plated. The Zoe & Morgan ring will set you back £85 and £49 for the Laura Gravestock one which is also available in Rose Gold Plated which i am as equally tempted to buy! I have lusted after the Sydney Evan love ring ever since i first saw it on Lorraine Stanick and more recently on Laura of Lollipop26 fame. It is simply stunning, so elegant and classic and a ring that could be worn daily. The only downside to this beautiful ring? The $975 (£620) price tag! Ouch! 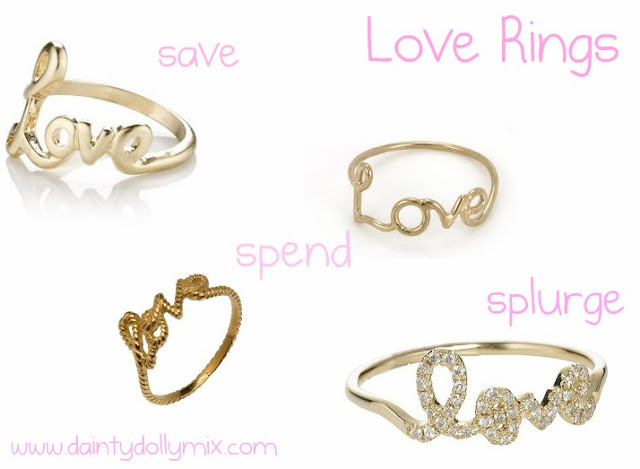 So ladies, what are your thoughts on gold love rings? and do you like my idea of a 'save, spend, splurge' series? so gorgeous! I love these rings! fab for valentines day!